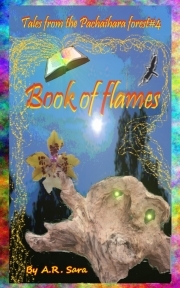 Description of "Book of flames"
Garium and his friends go on an outing, their thoughts brimming over with devious plans. But they unwittingly stumble upon something very unexpected...A book like no other...that makes Garium give in to its strange and insistent pull, with grave consequences. Soon a power beyond his wildest imagination is unleashed and Droom, Pachaihara and the other realms are swept into a vortex of mayhem and misery. Now all hope rests on the unfolding of an old and incomplete prophecy. A.R. Sara is a pen name the author coined for herself to explore her passion for writing. She resides in India with her very supportive husband and two kids. She had been considering writing for a long long time. Then a nudge and a push from her kids. So the “Tales From The Pachaihara Forest” took shape! Since the idea of the Tales from the Pachaihara forest took root, she feels strongly compelled to take it further. To tell the tales of the various beings that dwell this fantastic forest as well as the neighboring Droom forest. Reviews of "Book of flames"